» What About Wiggins and the Wolves? What About Wiggins and the Wolves? The Kevin Love trade has been inevitable for weeks now. We’ve known the structure, we’ve known the timing, everything. But Thursday, Adrian Wojnarowski reported the deal was officially struck — unofficially until August 23, of course — and now everyone is ready to start talking about it like it’s real. We’ll have the next 27 months to nitpick this Cavs roster, but we need to talk about what just happened to Minnesota. This all started two months ago, when President Flip Saunders hired Coach Flip Saunders. It was still early June, but we already had the saddest story of the offseason. Then, almost as if it were a dare to see if he could drive Wolves fans into a deeper depression, Saunders began making a play to trade Kevin Love to the Warriors for David Lee and Klay Thompson. It was the sort of deal that sounded bad at first, and only got worse the more you thought about it. Flip was going to give away a top-10 player for … the right to pay $90 million to Klay Thompson. And David Lee’s contract, which wouldn’t even be that helpful, because once that money got cleared, how many stars were signing with Minnesota, anyway? There were also reports that Minnesota wanted Harrison Barnes, but that made it only slightly less ridiculous. 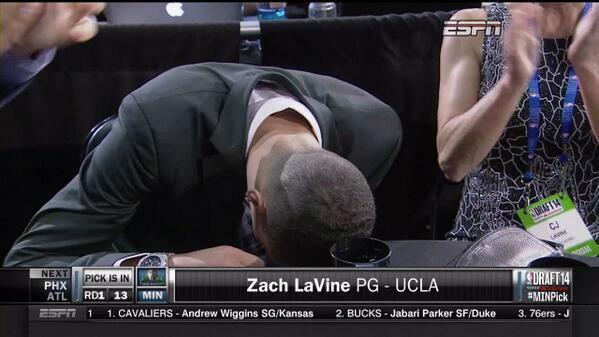 Then, when Zach LaVine got drafted by the Wolves, he looked like somebody had just told him he was going to Siberia. This was accompanied by the “F–k me” Vine heard round the world. It was a dark time all around. Now? It’s not a dark time! LaVine corrected the record regarding draft night: “When my name got called, I lost it. I put my head down, thanked God, and from there, I just lost it.” Then he proceeded to obliterate every rim in Las Vegas. Meanwhile, the Warriors inexplicably refused to include Klay Thompson in the Love trade — saving Flip from himself. Free agency started, and there was a new option out there. According to Brian Windhorst, appearing on the B.S. Report, the Love trade started with an agreement between owners Dan Gilbert and Glen Taylor, and then the deputies (David Griffin and Flip) were instructed to work it out from there. Almost by accident — and the Illuminati powers of LeBron and NBA owners — the Wolves held out, and then stumbled into the greatest return we’ve probably ever seen for a superstar. People praised what Utah got for Deron Williams — the Love trade will blow that out of the water when it finally gets done for real. It’s incredible. How much better is this than going into the year from hell with Love? Or trading for Klay Thompson and five years of 10th-place finishes? Or even re-signing Love to a long-term extension and losing in the first round for the next four or five years? This new team of alley-oop artists just made the Wolves exciting again. Every night is going to be a dunk contest. Every player wants to be there. And instead of the team facing the “win or Love might leave” pressure that has haunted this whole franchise the last few years, there are zero expectations now. They would’ve won more if Love had stuck around, but without him, this is a team people can actually love. Isn’t that better? On the Monday before LeBron signed, I came into the office and told Danny Chau that the Cavs were going to sign LeBron and trade Wiggins and Bennett for Love. This was 80 percent wishful thinking. We’d get basketball soul mates (Love and LeBron) paired together on a new superteam that everyone could root for. They’d score 120 points a game and make the Cavs the most exciting team in the NBA. It was the dream scenario for Cleveland. But as all this got real over the past few weeks, I think I’ve gotten just as excited for Minnesota. Especially Andrew Wiggins. My old roommate has a theory related to the above clip: Andrew Wiggins will be better off in Minnesota than he would’ve been in Cleveland. This flies in the face of conventional wisdom — including everyone involved in The Great Grantland Trade Debate from a few weeks ago — but it makes sense if you really think about Wiggins. His biggest problem at Kansas was that he couldn’t always assert himself and take over games. That was the only thing standing between Wiggins the incredible athlete and Wiggins the future superstar. Part of this was technical (he needs to get better at ballhandling) and part of it was practical (Kansas didn’t need him taking 22 shots a game). When Joel Embiid went down, the whole game plan changed for Kansas, and we got a chance to see Wiggins take over the offense. It ended with him scoring 28 a game over the course of four games (his final regular-season game through the first game of the NCAA tournament). Imagine if he’d played like that all year, or even close. We’d be talking about him like he was the next Kevin Durant. He followed that stretch with four points against Stanford in the tournament, but still. We got a glimpse of a completely different player from the Wiggins we’d gotten all year — mostly because that’s what he had to be. Given all that background, would it really be better for him to spend his career next to Kyrie and LeBron? It’s not that young guys can’t thrive next to older stars — Magic Johnson and Charles Barkley turned out OK. But Wiggins has specific weaknesses in his game that keep him from unleashing hell on people, and those weaknesses would be magnified in Cleveland. His game has limits right now, and in Cleveland, none of them would be a problem. He’d never have to turn into a dominant ball handler (Kyrie), or even really a slasher (LeBron). He’d never have to take over a game like he did late in the year at Kansas, and nobody would complain. He could turn into a more athletic version of Harrison Barnes, and that would be fine. As long as he could defend and knock down jumpers and dunk all over people in transition, he’d be perfect for the Cavs. Maybe he would have magically turned into a superstar as an added bonus and the torch would have been passed from LeBron to Wiggins in five years, but I don’t know. That’s generally not how human nature works, in basketball or anywhere else. You can grow only so much when you’re not given responsibility. It’s tough to become a franchise player if you never have to carry a franchise. If you think Andrew Wiggins can be a top-10 or top-five player one day, Minnesota’s the best place for him. If you think he’s destined to be a killer role player somewhere, that’s fair. But did you really watch those Big 12 tournament highlights? Regardless, Wiggins is almost out of limbo now, and the phenomenally depressing SportsCenter interviews are behind us. Then there’s Anthony Bennett, who should turn into a much better player than the rookie we saw last year. If Minnesota flips him for Thad Young in a few weeks, that’s fine, too. It just means that Ricky Rubio will be running with Wiggins, Thad, LaVine, Gorgui Dieng, Shabazz Muhammad, Glenn Robinson III, and then Nikola Pekovic lumbering down the court behind them, ready to use his body as a wrecking ball down low. Wherever the Wolves go from here, as soon as this trade happens, basketball’s fun again in Minnesota. It’ll be a beautiful mess full of dunks in the short term, and there’s plenty of real hope for the future. It’s all so much better than another year praying for a 7-seed with Kevin Love.